The Lagos State Police Command said it has found the two children kidnapped by a househelp in Gbagada area of Lagos, Southwest Nigeria. The two children of Mr Aneru Mutana of Gbagada Phase 2, Lagos, were kidnapped on November 26, 2018 by their househelp, simply identified as Busayo. A statement issued by Police Public Relations Officer,PPRO, Chike Oti said the children were found in the early hours of Sunday at a location close to Nigeria Seme border, in Benin Republic . Recall that the said Busayo was on November 25 instructed by Mrs Mutana, to pick the children from school and take them home as she was not able to do so due to the nature of her job. 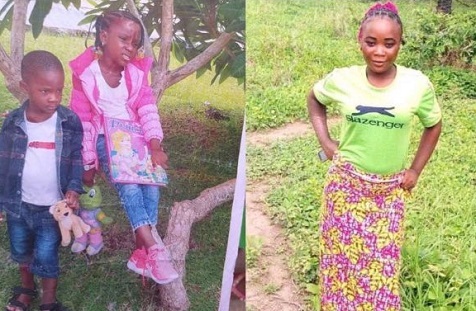 Unfortunately, the househelp had carefully planned how to kidnap her children, a 6-year-old boy and a 3-year-old girl and executed her wicked plan effortlessly because she is known to the school authorities and familiar with the children. According to Oti investigation so far revealed that Busayo was a member of a Kidnap syndicate who gave her out as househelp to unsuspecting parents. “When she finally landed the job, she warmed her way into the children’s heart and won the trust of her employers. Once she gets to this stage, she bares her fangs,” he said. Oti said the Commissioner of Police, CP Edgal Imohimi warned households interested in engaging the services of domestic servants to beware of whom they were dealing with, reiterating his earlier warning that employers ought to carry out a background check of persons they were bringing to homes; and profile them in order to make investigation easy for the police should the need arise.